Cravings can beat the best of us … especially when they seem to strike out of nowhere. But sometimes that “out of nowhere” really isn’t, as there is an underlying reason you suddenly can’t get that bag of kettle chips out of your mind. It’s because your body is trying to tell you something. First, it’s important to note that if you suffer from cravings, you’re not alone. One of the most common questions people ask me is how to combat sugar and salt cravings. And as I always say, how you heal one thing is how you heal anything – and that also applies to food cravings. So whether you’re craving potato chips, a jar of pickles, or a chocolate milkshake, understanding why your food cravings are happening in the first place is the best way to resolve them. Now, the answer about what’s causing you to crave specific foods isn’t always straightforward. But if you’re frequently craving salt, it could be a sign of emotional stress, physical stress, a nutrient deficiency, or all of the above. It should also be noted that craving salt isn’t necessarily a bad thing. While processed table salt has a bad reputation for promoting high blood pressure, we need small amounts of naturally occurring sodium in our diets, which can be found in several fruits and vegetables, such as celery, beet greens, sea vegetables and olives. In the right amount, sodium actually helps maintain blood pressure control, adrenal function, and cellular metabolism (1). It’s only when we consume too much sodium – usually in the form of processed table salt – that health problems can arise. Unfortunately, when a strong salt craving hits, we’re more likely to lust after a bag of potato chips loaded with table salt rather than a bowl of beet greens, am I right? 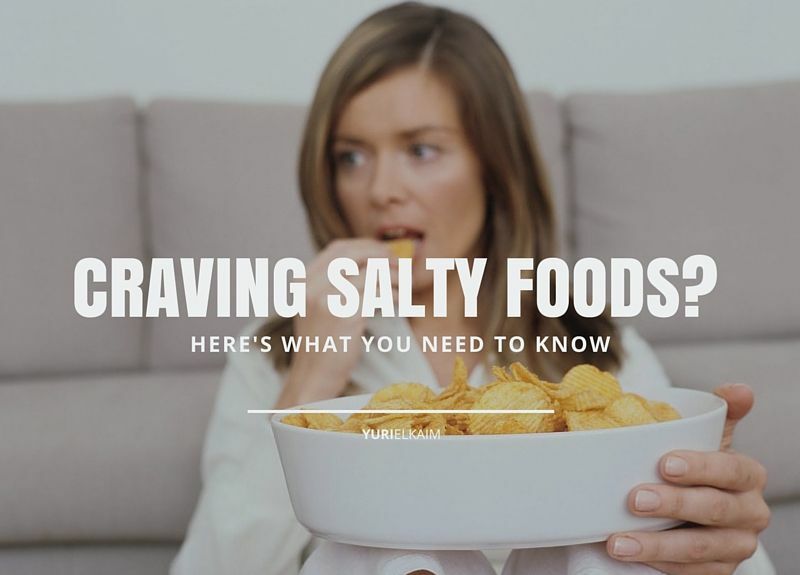 To help stop those cravings, let’s take a look at the possible reasons why you crave salty foods, and some nutrition tips you can use to stop the cravings naturally. Why Do I Crave Salty Foods? Simple conditioning means you associate a taste/food with an activity. For example, associating popcorn with a favorite TV show or movie, or an ice cream sundae with when your grandmother comes to town. 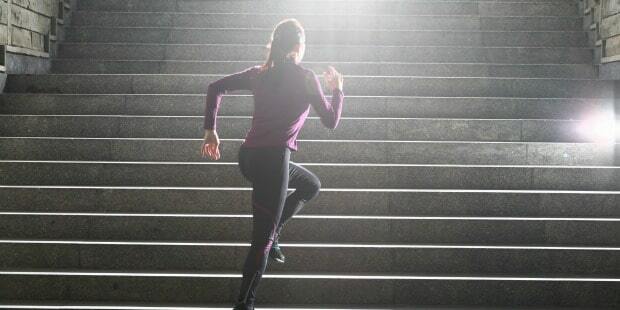 Simple conditioning can occur at any age, but often stems from childhood. 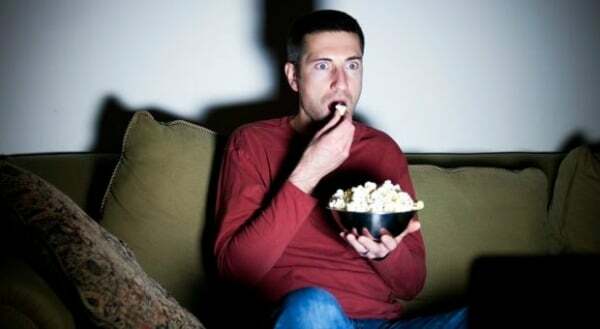 So it makes sense that if you’ve always had popcorn with your favorite TV shows as a kid, you still associate that food with watching your favorite show. To find out whether conditioning is causing your cravings, start to pay attention to when yours strike. If you notice a specific craving come on as you begin to think of a certain event, activity, or situation, then there’s a good chance your craving is a result of simple conditioning. If that’s the case, try to satisfy your salt cravings first by eating a few olives, or even chowing down on some nuts, oven-roasted chickpeas, or avocado. Stress directly impacts your adrenal glands, which sit above your kidneys. They’re responsible for helping your body handle stress by producing stress hormones including cortisol and adrenaline. Your adrenals also produce a hormone called aldosterone, which helps your body maintain a healthy sodium and potassium balance (2). 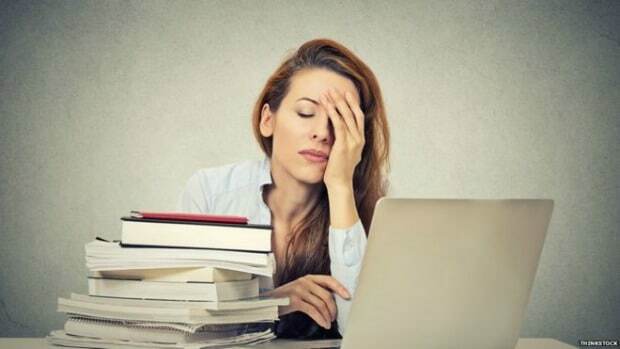 Unfortunately, when we’re constantly exposed to high stress levels (which many of us are each day), our adrenal glands can become worn out and depleted. And when your adrenal glands become suppressed, your body may not be able to produce an adequate level of hormones, including aldosterone. Since aldosterone regulates your sodium and potassium balance, having low levels of aldosterone can cause your body to release too much sodium and retain too much potassium (2). To compensate for a lack of sodium, your body may send signals in the form of salt cravings. That’s why managing your stress levels may help cut your cravings for salty foods. By adding simple stress-relieving techniques to your daily routine, like meditating, practicing yoga, or spending time outdoors, you’ll help regulate your adrenal function, which can eliminate cravings. In addition, you could try using ashwagandha. When you sweat during exercise, you naturally lose electrolytes like sodium, which explains why you might crave salty foods after you work out. Also, exercise is a form of physical stress. And while this isn’t necessarily a bad thing, it can suppress your adrenal function further if you’re already under a moderate amount of stress. We’ve already covered why stress prevents your adrenals from retaining the proper amount of sodium you need. If your exercise routine revolves around higher-intensity exercise – like HIIT – it might be easier on your adrenal glands to alternate your workouts between high and lower intensity exercise, such as yoga. Yoga has been shown to promote stress relief, which further supports your adrenal gland function (3). It’s easy to add yoga to your daily routine, especially with this Simple 5 Minute Morning Yoga Routine. It’s also important to replenish the electrolytes you lose during exercise by having a post-workout snack full of vitamins and minerals. I personally recommend this Peanut Butter Protein Shake because it contains spinach, hemp seeds and cherries, all of which are excellent sources of electrolytes, including potassium and sodium, to help satisfy salty food cravings. Studies have shown that being dehydrated can cause low sodium, which may result in salt cravings (4). Sodium helps our bodies retain water to keep our cells properly hydrated. 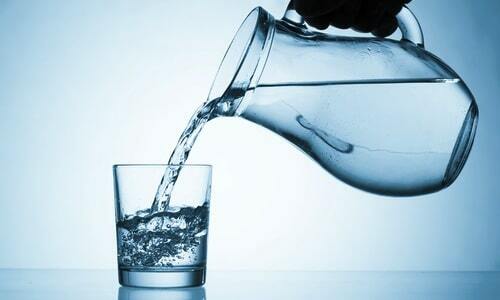 But when we don’t drink enough water, our cells can actually lose electrolytes, including sodium (5). Factors contributing to dehydration include intense exercise and high alcohol or caffeine consumption. The next time a salt craving comes on, it’s a good idea to throw back a few glasses of water before you reach for a salty snack. If your cravings are persistent, it’s a good idea to track your daily water consumption to make sure you’re drinking enough. As a general guideline, you should drink at least half of your body weight in pounds, in ounces. For example, if you weigh 150 pounds, you’d drink 75 ounces of water each day, and extra when necessary to compensate for dehydrating beverages or intense physical activity. The obvious way to stay hydrated is to keep a filled-up glass of water with you so you can sip throughout the day. Increasing your fruit and vegetable intake also boosts your water intake, while at the same time giving your body a natural source of sodium. The easiest way to up your fruit and veg intake is by starting off your day with a green smoothie each morning. And green smoothies don’t have to be boring or taste like grass. Here are 11 Green Smoothie Recipes That Will Rock Your Tastebuds. Just like physical activity causes your body to release sodium through sweat, drinking too much water can dilute the amount of sodium in your blood. This is another reason why tracking your daily water intake can be help determine whether your salt cravings are caused by too much (or too little) water. The more you eat something, the more you tend to crave it. So, if your diet is already rich in salt, that could be the reason you crave salty foods on a regular basis. Estimates show that the average American consumes anywhere between 3,400 to 5,000 mg of sodium per day, and sometimes more. That’s significantly higher than the daily recommended allowance of 2,300 mg.
What’s worse: most of this sodium is coming from processed table salt found in packaged food, boxed foods, and restaurant meals. If you’re craving salt because you already have a lot of it in your diet, there really is no quick fix besides cutting back the amount of sodium in your diet. You can also help satisfy your cravings in a healthier way by eating fruits and vegetables that naturally contain sodium, like sea vegetables (seaweed, nori, kombu), celery, capers, green leafy vegetables, carrots, and apples. These foods are also important when it comes to eating for energy, which helps support your adrenal function, and may indirectly cut cravings for salty foods. 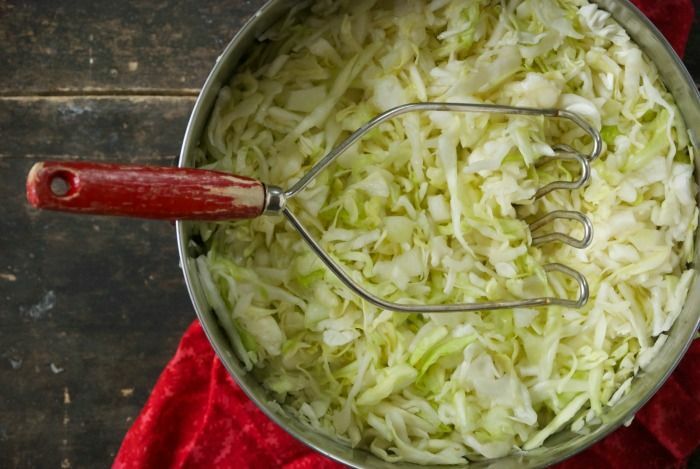 Fermented foods like kimchi and sauerkraut are another good source of natural sodium, which also contain probiotics for healthy digestion. Salt cravings can also indicate a vitamin or mineral deficiency. However, that’s not to say you’re necessarily deficient in sodium. 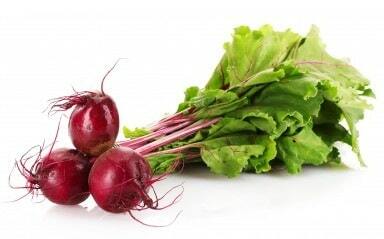 Your adrenals help regulate your mineral balances, especially between sodium and potassium. When your adrenal glands are suppressed from prolonged stress, your body’s ability to maintain proper mineral balances can become impaired. If vitamin and mineral deficiencies could be the cause of your cravings, it’s important to prioritize your adrenal health to help improve your adrenal function and mineral regulation. How to do that: get your stress level under control, get enough rest, and increase your intake of nutrient-dense foods. To find out if you have any mineral deficiencies, you can do a hair tissue mineral analysis (TMA) test, which can be administered by a naturopathic doctor. TMA tests vary in price, but are usually within the $150 to 250 range. While these are the most common reasons for salt cravings, cravings are a very individualized health symptom and rarely have a simple cause. It’s true that food cravings are often related to your diet or lifestyle in some way, but many natural healthcare practitioners also believe that salt cravings can have a spiritual component, such as holding on to suppressed emotion and anger. So, if the solutions above don’t make a difference in your cravings, exploring potential unresolved, underlying emotion could be a helpful next step to resolve the craving for salty foods. If you’re looking for a natural jumpstart when it comes to “cleansing” your body and feeling better, check out my 1-Day Detox. You’ll banish bloat, gain energy, and generally feel better, thanks to the nutrient-packed mouthwatering “detox” meals. You can get the detox plan – for FREE! – by clicking the banner below.